These apex predators are my favorite to fish for. Nothing gets your adrenaline flowing like these ferocious feeders. 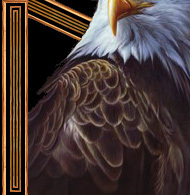 Our season opens the 3rd weekend in June. This time of the year the BIG girls are up spawning in shallow water. We can actually sight fish in the water this time of year and we see big fish in as little as 2 - 3ft. of water. It's a thrill to cast baits right at the fish and watch them hit the lures. Here on Eagle Lake we had a minimum length of 48". Thru the 70's and 80's, size restrictions allowed many of fish to reach the 50" mark and bigger. In the early 90's we went to a 54" minimum to protect these big fish even more. 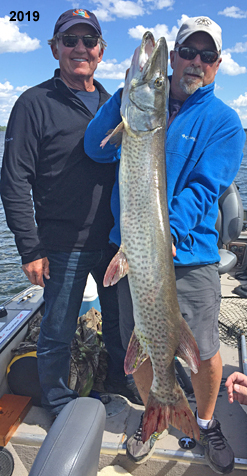 Now we consistently catch and raise many fish from the 50"- 56" range and these fish are HEAVY! 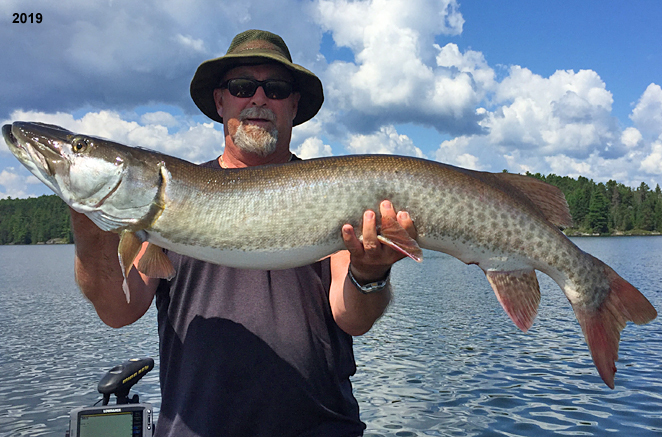 Due to the high volume of Ciscoe forage, Lake Trout and Whitefish in the lake, the Muskie are well fed. 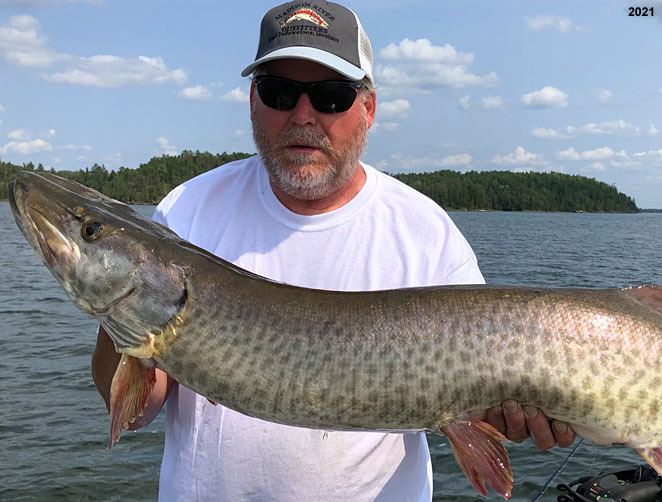 This is probably why many avid Muskie hunters believe the next world record will come from Eagle Lake. Early season we are casting top water lures like Jack Pots and Creepy Crawlers. We use mid-sized Spinner Baits and Bucktails around the newly forming weed beds. The rods we use are 6'6" - 8' medium heavy and heavy with bait casting reels loaded with 60 - 100lbs braided lines. Heavy titanium or 100lb. florocarbon leaders and heavy salt-water snap swivels are also needed. Even with heavy equipment, these fish will still bust up our tackle occasionally. The fish are now cruising the weed lines and first break lines and are staging off of the points and roaming the sand flats. During this period we locate most fish with larger Spinner Baits and Bucktails. The colors this time of year are important as we try and mimic the walleye and perch patterns more. Many of the Muskies that are using the points for ambush areas. We catch on 8" - 10" Jerk Baits and some smaller Crank Baits and smaller Rubber Bull Dogs. Top water action on the calmer days and nights will find some big girls in the 6' - 10' weed beds. Because of the semi-clear water good light penetration , we can have very healthy weedbeds growing as tall as 12 ft. Big Muskie like these deeper weed beds this time of year as they are generally closer to the deeper water areas. 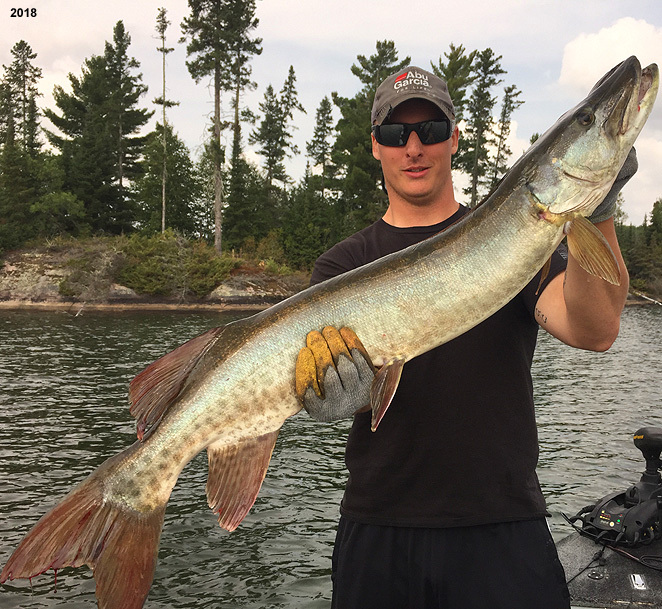 Another popular technique we use is to fan cast Bucktails, Spinner Baits and Jerk Baits over larger sand-flats while looking for those roaming Muskies that are following schools of Walleyes or Perch. This is a good way to catch multiple Muskies in one area. 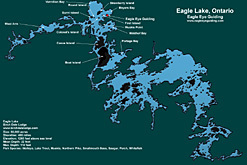 This is known here on Eagle Lake as the big fish period. Muskies are beginning to do some serious feeding to build up fat for those cold winter months to come. We still locate some fish in some of the fading weed beds as they still use them for cover. This time of year we are going to bigger baits. 12-inch Crank Baits, bigger Bucktails & Spinner Baits and large rubber baits are very effective. Many of the bigger females are now moving out to the main lake basins where all the sunken structure is. This time of year we will do some trolling around these reefs as well, although I am mainly a caster as I enjoy the thrills of the follows and boat side strikes. This time of year we are also catching some big Northerns on our Muskie baits as well as they are feeding for winter also. Most of my Die Hard Muskie Hunters are looking for that possible world record. 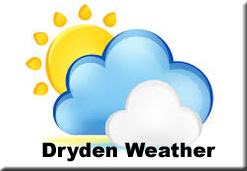 Fishing during the period from mid September thru to mid November is their best chance. This period produces very heavy fish regardless of their length. Many fish in the 50"- 56" range are caught this time of year. In the last couple of years we have actually measured a couple of fish in the 60" range. They just followed to the boat and laid there. We stuck our 60" floating stick over them and they were at least as long as the stick. These could be record fish that time of year so come on up to my neck of the woods and let's get one! 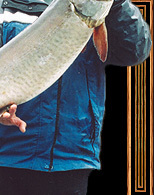 We offer evening Muskie hunts. 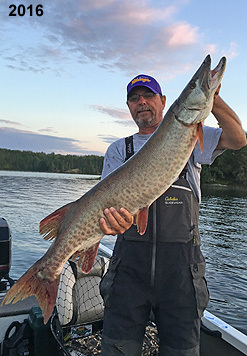 Muskie fishing in the evening right until dark is a very popular service for two main reasons. For one it allows a lot of people that normally don't fish for Muskies to give it a try, as I supply all the gear at no extra charge if they need it. Second, it's usually about a 3 to 4 hour hunt and it does not wear the beginners out throwing such big lures. I have had a lot of beginners get hooked on Muskie fishing during these hunts and they have come back the following year with all the right gear and hire me for a day or 2 or more to chase these toothy critters. I also have had many of days where customers are so jacked-up by all the action that we had during the day, they want to take a supper break and then go out and finish the day with a bang! Quite often Muskie are more in the mood for feeding in the evenings. We leave the docks at 6 pm and fish until dark. The great thing about this hunt is that I have located fish during the day that did not strike a bait but are still in the area and in the evening they usually feed. One huge bonus of the evening hunts are the sunsets you get to experience. On a clear evening they are truly remarkable and can be seen all summer long.